Injured in a motorcycle accident? We can help. Led by Partner and rider David Sweat, our motorcycle accident attorney in Volusia and Flagler Counties have decades of experience and have recovered millions of dollars in compensation. If you have been injured in a motorcycle accident, you need to assert your right to just compensation. From the cost to repair or replace your bike to the long-term financial costs of accident-related injuries, you may be entitled to a significant financial recovery, and the driver who hit you deserves to be held fully accountable. 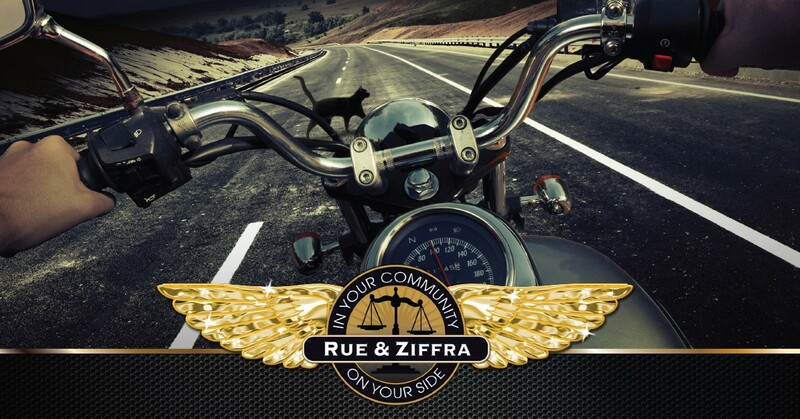 At Rue & Ziffra Law Offices, we are committed to fighting for the rights of injured bikers in Volusia and Flagler Counties. We have been serving the local biker community since 1976, and we have a long record of success helping our clients collect the compensation they deserve. As a motorcycle rider, you have the same rights as everyone else on the road. This means that you have the right to occupy your lane the same as a car or SUV, and you have the right to sue for just compensation when a negligent driver causes an accident. Distracted driving, aggressive driving, and just plain carelessness are to blame in the vast majority of motorcycle accidents. At Rue & Ziffra Law Offices, we take an aggressive approach to holding negligent drivers accountable for our client’s accident-related losses. To prove our commitment to injured motorcycle riders, we created a separate website, AttorneysforBikers.com, which provides accident-related and non-accident-related information for bikers in Central Florida and along Florida’s Space Coast. There, you will find additional information about your rights, important insurance considerations, and a special message from firm Partner and biker David Sweat. Of course, each case is unique, and the outcome of a motorcycle accident case is never guaranteed. But, what we can guarantee is that we will use our attorneys’ 180+ years of combined legal experience to fight for the best possible outcome in your case. Careless (Negligent) Driving – Common forms of careless (negligent) driving include: failing to look before turning, merging in front of (or into) approaching motorcycles, and running red lights and stop signs. Distracted Driving – Distracted driving includes (but is not limited to): eating and drinking, looking at GPS directions, talking on the phone, texting, sending emails, and using social media behind the wheel. Drowsy Driving – AAA estimates that one in five fatal accidents is the result of drowsy driving. Regardless of the time of day, drowsy drivers can present extreme dangers for bikers. Drunk Driving – The dangers of drunk driving are indisputable. For bikers, an encounter with a drunk driver can be a recipe for disaster. Aggressive Driving – From tailgating to speeding and weaving in and out of traffic, the dangers of car and SUV drivers’ aggressive driving habits are magnified for motorcycle riders. Inexperienced and Reckless Bikers – At Daytona Bike Week and other group rides and events, inexperienced and reckless bikers can, unfortunately, cause accidents with other riders. Negligent Truck Drivers – Semi trucks and tractor trailers are involved in a disproportionate number of serious and fatal accidents. Car, Truck and Motorcycle Defects – Along with driver negligence, car, truck, and motorcycle defects can cause dangerous accidents as well. Common defects include defective accelerators and throttle, defective brakes, and defective tires. Road Hazards and Defects – If you lost control due to puddling water, accumulated debris, a pothole, loose construction materials, or any other issue with the road, the local road or highway authority (or a private contractor) may be to blame for your crash. Q: How does motorcycle insurance work in the event of an accident? Your accident claim will most likely involve a claim against your personal injury protection (PIP) policy. PIP covers 80% of your medical bills, 60% of your lost wages, and certain out-of-pocket expenses up to your policy limit (less your deductible). By law, you are required to carry a minimum of $10,000 in PIP coverage. If another driver or biker was at fault and he or she has bodily injury liability (BIL) insurance, then you can file a fault-based claim with his or her insurer. However, in order to file a BIL claim, you must be able to prove that you have suffered a serious and permanent injury. If the driver or biker who hit you was uninsured or underinsured (meaning that his or her BIL coverage is insufficient to cover your losses), you can file a claim under your own uninsured/underinsured motorist (UIM) policy – if you have one. If you have UIM coverage on multiple vehicles, you may be able to “stack” your coverage in order to maximize your financial compensation. Q: What should I do at the scene after a motorcycle collision? No matter what happened, at the scene of an accident, your safety needs to be your first priority. If you can walk, get yourself safely off of the road. Call 911 to report the accident, and seek emergency medical attention if necessary. If the other driver or rider stopped, collect his or her insurance information, and ask for names and phone numbers from any witnesses as well. Now is also the time to call an attorney. An attorney with experience representing bikers will be able to walk you through the steps you need to take (and the mistakes you need to avoid), and he or she will be able to initiate an investigation right away. Our firm has nine office locations throughout Volusia and Flagler Counties, and we can take action immediately to protect your legal rights. Q: What should bikers do to protect their rights in the event of a collision? Practice ATGATT (All The Gear, All The Time) – Even though helmets are not mandatory for riders over age 21, if you go down, your helmet may be the only thing protecting you from a traumatic brain injury. Motorcycle boots can help prevent foot and ankle fractures, and motorcycle pants and jackets can prevent (or at least mitigate) road rash in the event of an accident. Ride Within Your Limits – You know your limits better than anyone else. Don’t let other riders push you, and try not to respond to aggressive drivers. The open road is not the place to test new skills. Find an empty parking lot, or better yet, sign up for an Motorcycle Safety Foundation (MSF) class. Inspect Your Bike Before Every Ride – Do all of your lights work? Is your oil level okay? How are your tires? What about your brake pads? Is your chain tensioned and lubed? Performing these simple checks before every ride can help prevent serious accidents and accident-related injuries. Check the Weather – Sudden rain storms can make the road slick; and if you don’t have the right gear, riding in a downpour can become very dangerous. It’s easier than ever to check the weather – so before you start your engine, make sure you are prepared. Observe the Law – Whether you are riding to work or making your way to Daytona Bike Week, it is your obligation, as a biker and a citizen of our local community, to always observe the law. Don’t speed. Don’t “lane split” or weave through traffic; and most importantly, don’t give anyone an excuse to blame you for your own accident-related injuries. If you have been injured in a motorcycle accident in Volusia or Flagler County, contact us for a free, no-obligation consultation. We are available 24/7. To speak with an attorney about your rights, call (386) 788-7700 or tell us about your accident online now.